Reading Sounds™ 1 Pro (for Windows™ XP, 7, 8, 10) uses a unique, highly effective, patented system to teach children to associate letters and letter patterns with the sounds they make. It also teaches blending, segmentation, sight word recognition and other key literacy skills found through research to be crucial in the development of reading and spelling ability. The program automatically adjusts learning support for each student. It identifies each student's skill strengths and weaknesses. It spends less time on established skills, and more time with more support on areas of skill weakness, leading to fast and effective learning. Reading Sounds™ 1 Pro is designed for parents, teachers, literacy specialists, and anyone else interested in teaching children how to read and write. The software is highly intuitive for untrained users such as parents while providing optional advanced features and flexibility for the literacy specialist. It is ideal for children aged between 4 and 8 years old, although it is suitable for older children who are experiencing reading difficulties. The program is available for individual PC computers (click HERE for details) or as a network version, allowing for installation on many computers (click HERE for details). Learning letter-sound relationships is difficult for beginning and struggling readers because an association must be made between sounds and symbols with arbitrary relationships (there is no meaningful relationship between the way letters look and the way they sound). It is the process of teaching these sound-symbol relationships, the elemental building-blocks of reading and writing, and understanding the relationship between these symbols and spoken language, which poses a great challenge to educators. This challenge has led to the development of the Reading Doctor® teaching system. Reading Doctor® Software uses a revolutionary, multi-sensory system for teaching and strengthening letter-sound relationships. Children are taught meaningful associations between the way that letters and letter patterns look and the sounds they make through a system of visual (shape), auditory (sound) and articulatory (the way you say sounds) memory aids, or mnemonics. The Reading Doctor® system identifies what a child knows, what the child does not know, and which patterns the child confuses. Using a unique and highly effective approach, the system teaches children to discriminate between confusing patterns, and strengthens weaknesses in letter-sound pattern understanding. After learning letter-sound patterns using the Reading Doctor® system, letter-sound relationships are no longer arbitrary, difficult to learn relationships. The Reading Doctor® teaching system has identified and strengthened those patterns that were the most difficult for the student. The student now has strong visual, auditory and articulatory associations between the letters and the sounds they make, and the relationships between letters and their sounds are no longer abstract and hard to remember, rapidly improving reading and spelling skills. After learning the most common letter-sound relationships, Reading Sounds™ 1 Pro teaches students how to combine letter patterns which represent the sounds in language into words through specially designed 'blending' exercises in which students practice combining letter-sound patterns together to form words. Students also practice the 'segmentation' of words into their component sounds and the letter-sound patterns that represent them. This is achieved through a unique approach which identifies areas of weakness and confusion in the student's knowledge. Reading Sounds™ 1 Pro also teaches children how to recognise the most frequent, irregularly spelt 'sight words' in English, such as "who, said" and "there". These words form around 5-10% of English words, do not conform to common letter-sound patterns in English, and are more difficult to learn for beginning readers. Reading Doctor® Software utilises a unique approach to teaching irregularly spelled sight words. The emphasis is on visual memorisation rather than using sound-symbol correspondence, with the system highlighting and assisting children to memorise the irregularly spelt letters (such as the "ai" in "said"), while applying the same revolutionary teaching method used in the other components of the software. While Reading Sounds™ 1 Pro is designed to guide your student through activities suitable for their skill level, every aspect of the activities in the program may be controlled by a parent, teacher, or literacy specialist. The program includes a large database of regularly spelt words divided into their corresponding letter-sound components. Each word has corresponding broadcast quality recordings of the words as well as the word's component sounds. Each word also has a corresponding picture and may be displayed according to letter-sound patterns. The software allows for the customisation of activities based on letter-sound patterns. For example, if a child confused "b" as in "bed" with "d" as in "dig", it is possible to design an activity which contrasts words containing these patterns in a matter of two mouse clicks! Activities may be selected by specifying the word patterns to be practiced through an inbuilt word search engine (so for example, it is possible to indicate that you want your student to practice distinguishing between words that begin with "b, d" or "p", or end with "at", or have "o" in the middle). You simply tell the software which word group you want your child to practice, and the software creates activities based on your requirements! All student activity is recorded by the program for easy progress monitoring, and this information may be printed for easy record keeping. Reading Sounds™ 1 Pro incorporates a sophisticated assessment feature facilitating comprehensive monitoring of individual students using the built in testing modes. 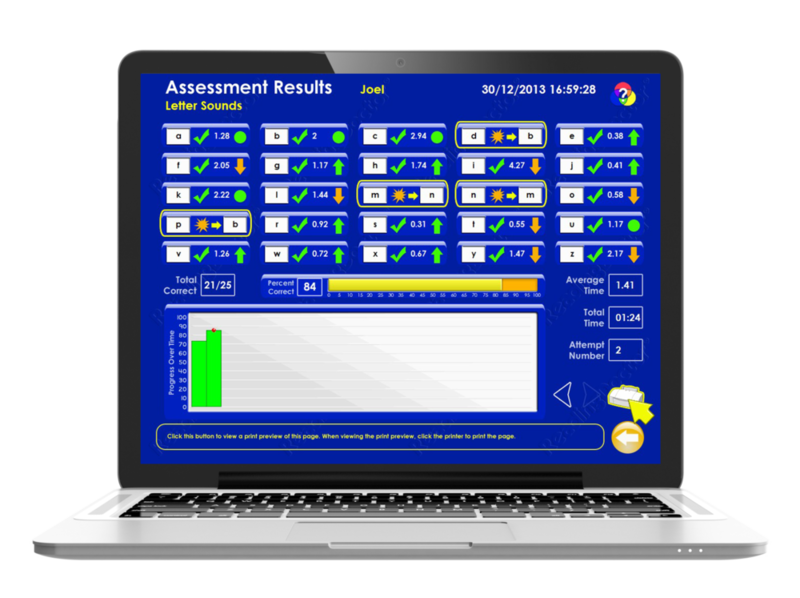 The testing feature provides detailed information about current and past performance, allowing parents, teachers and the students themselves to see the difference that Reading Doctor® Software makes. A printing facility allows the user to produce a ‘hard copy’ of this information. All of the material that is taught in Reading Sounds™ 1 Pro may be printed as ‘flash cards’ from within the program. These flashcards may be easily customised to include visual cues to assist recognition. The flashcards may be used by parents, teachers or clinicians in activities such as card games to further strengthen and reinforce the skills taught in the software. Using Reading Sounds™ 1 Pro, parents, educators and literacy specialists can significantly improve the literacy skills of children who are struggling with reading and spelling, as well as children beginning to read and write. Parents, educators and literacy specialists can offer children a fun, effective, and scientifically based learning experience in arcade-style format which children will thoroughly enjoy. The unique method of teaching used in Reading Sounds™ 1 Pro is so effective that parents and educators typically observe noticeable progress after just a couple of hours of using the software!